First time on Sax Station? Then start here and learn more about my saxophone lessons. Struggling with Music By Ear? How to play the Baker Street alto sax line. Song by by Gerry Raferty (1978). Originally played by Raphael Ravenscroft. Baker Street is in Raphael Ravenscroft’s book but not in D major. So you could get that music and then transpose it (down a whole step) if you want. Or you could play it in the other key. The glissando sounds like a D major scale to me. And to make it sound right, you’ll have to bend some notes. Alto & Bari Sax Transposition – How To? Not bad, considering that you’re not too comfortable with the octave key. You’re probably going to want to spend some time working through all of the notes. Start with the mid range. There’s a video I did with just the mid range on alto. And play some songs using the midrange to make things more interesting. Then maybe come back to Baker Street. Hi Neal, i’ve been asked by a friend to learn a 12 bar blues on saxophone to play with his band! I can’t find any material online….help please?! Check out ‘Tenor Madness’. You might want to learn it by ear. Should be on youtube, it’s on the Sonny Rollins recording ‘Tenor Madness’ too. Thanks for saying so Val. Where can I get sheet music for Baker Street for alto sax in D major as you played it in this video? Baker Street is in Raphael Ravenscroft’s book but not in D major. So you could get that music and then transpose it (down a whole step) if you want. Tenor version of Baker Street , please. Want to play saxophone, but feeling lost and not sure how to get started? In this online/downloadable class you will see methodical lessons in a sequence and you can get feedback and ask questions at any point. Want to take your playing to the next level? 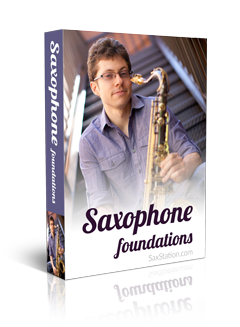 You’ll learn fundamental saxophone skills, building past the basics. Master rhythms. Learn about phrasing, tone, and more. Here you will get feedback which is crucial to developing good habits. Sign Up and you will get access to free lessons available to subscribers only! DISCLOSURE: Commissions are earned on some products through links you may see on the site. They help support running the site. Thanks! Copyright © 2019 SaxStation – No content on this site may be reused in any fashion without written permission from SaxStation.com.